Michelle Williams Recalls How Helpless She Felt During Pay-Gap ScandalShe received $80 per day compared to Mark Wahlberg’s astounding total of $1.5 million. No typos. Post Malone Cuts Hair in Hopes of Evading Whatever Death Curse He’s UnderHe’s also in a new Mark Wahlberg movie? Mel Gibson’s Ongoing Comeback Is Getting Help From Mark Wahlberg, Ari EmanuelTo please his client Mark Wahlberg, Ari Emanuel is reportedly helping Gibson’s return. Williams Paid 8 Times Less Than Wahlberg for All the Money in the WorldThe pay gap was a problem before the movie’s emergency reshoots. Mark Wahlberg Donating His $1.5 Million Reshoot Money to Time’s UpAnd in Michelle Williams’s name. SAG Investigating Michelle Williams–Mark Wahlberg All the Money Pay DisparitySAG-AFTRA is looking into reports that Michelle Williams made only $1,000 for movie reshoots while her co-star Mark Wahlberg made $1.5 million. Mark Wahlberg Reportedly Made $1.5M for Movie Reshoots; Michelle Williams Didn’tMark Wahlberg was reportedly paid $1.5 million for All the Money in the World reshoots, while Michelle Williams received only an $80 per diem. Will Mel Gibson Tank Daddy’s Home 2?Will Gibson’s history of assault and racist remarks affect the movie’s reception? Mark Wahlberg Wants God to Forgive Him for Starring in One Particular FilmDo four Hail Marys for this one. Kevin Spacey Is Unrecognizable As J. Paul Getty in Ridley Scott’s New MovieAll the Money in the World, directed by Ridley Scott, will be out this December. 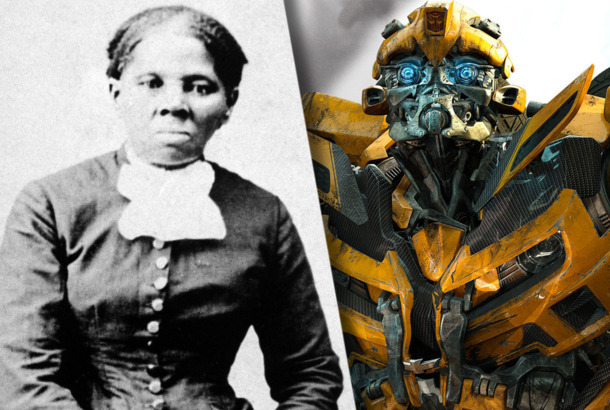 Did You Know Harriet Tubman Was Friends With Transformers?According to Transformers: The Last Knight, the famous abolitionist was in cahoots with the Transformers. Daddy’s Home 2 Trailer: Mel Gibson and John Lithgow Are Your New DaddiesHome for the holidays! That Time Mark Wahlberg Got Owned by His Daughter’s BoyfriendSmooth. Mark Wahlberg Wants His Own Movie Franchise, So He’s Making OneHe’s expanding the upcoming Mile 22 into a larger undertaking. Patriots Day Is Actually Very PoliticalDespite its stars’ protestations, the Boston bombing film is an unchecked embrace of vigilantism. Mark Wahlberg Stars in the Patriots Day TrailerIn theaters January 13, 2017. Trent Reznor and Atticus Ross Are Scoring Another Film TogetherGood choice in duo. 31 Ways Mark Wahlberg Has Escaped Death in His MoviesHe has weathered being shot in the face, blown up, beaten relentlessly, chop blocked by the Starship Enterprise, and so, so many shootouts. Mark Wahlberg and David O. Russell Are Reteaming for a New BiopicIt’s about Father Stuart Long, who was a football player turned priest. Mark Wahlberg and LeBron James Are Working on a MovieIt’s not Space Jam 2. Mark Wahlberg & Jimmy Fallon Use Giant SlingshotEvery kid’s dream. HBO’s Ballers to Return for a 3rd SeasonInfinite ball. Diddy, Wahlberg Donate 1M Water Bottles to FlintWiz Khalifa, Eminem, and more have also donated. The Story Behind Mark Wahlberg’s Giant Boogie Nights PenisHow the sausage was made, if you will. Hollywood’s Leading Men, Arranged in a Helpful Graphic From Shortest to TallestAt five foot two, Kevin Hart is by far the shortest. But which other A-listers made the chart? Let’s Not Forget What Reese Did in FearShe and Mark Wahlberg did some very crazy things. Ted Will Appear on the Oscars TelecastThe CGI bear, not Ted Turner or the ideas conference. Lots of Underhanded Blows From David Letterman to Kim KardashianPlus: Marion Cotillard’s strange photo shoot with the Nutcracker took her by surprise, and more, on our daily late-night roundup. When Celebrities Crash Weather Reports, Part TwoEven the rich and famous want to know whether or not to pack an umbrella. Watch the Trailer for Bay’s Pain and GainMark Wahlberg and Dwayne Johnson have muscles and steal. Pot Comedy in Development at FoxFrom Mark Wahlberg, et al. Wahlberg’s Creating Another Boston Reality ShowThis one’s inspired by the sisters from The Fighter. Michael Bay Is Now Considering Mark Wahlberg for Transformers 4The Internet rumors inspired him. Wahlberg Rumored for Transformers 4 [UPDATE]Actually, Michael Bay has shot down the rumor. So. Broken City Trailer: A Kanye Soundtrack Means It’s a ThrillerWahlberg and/or Crowe broke NYC. Movie Review: Ted Is a Comedy for the Idiot Adolescent in Every ManThis is the movie with the talking bear, in case you hadn’t heard.